Happy Sunday, everyone, and welcome back to the Butterfly Book Club. Today I have got such a gem to share with you, and it’s made even sweeter for me since the writers come from my home town. I have a big love for traditional children’s books however since I’ve been running this feature I’ve grown fonder and fonder of modern publications too and Mum… by Morty Sey & Scott Chegg captures everything I love about modern children’s picture books. First off, the look and feel – bright, eye-catching colours that capture even an adult’s attention so extra magical for children with simple, bold and modern illustrations that are beautifully clear and have such a comical air about them. Huge variety in illustrations too, every page is a feast for the eyes. 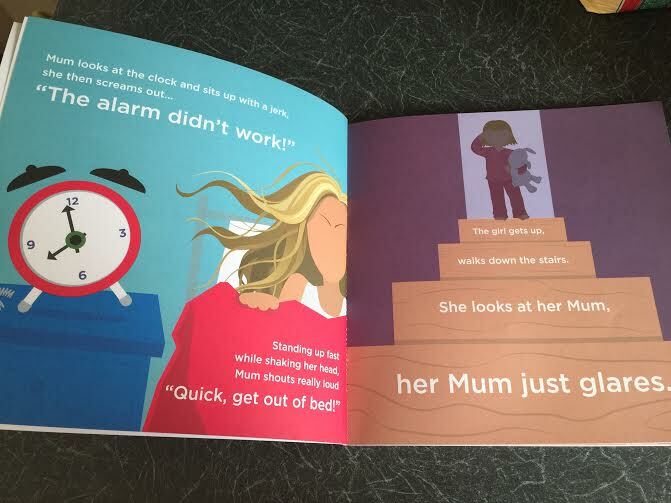 From amusing portrayals of what mum looks like when she first wakes up to a hilarious, algebra-laden instruction drawing of how to open a buggy, every page is a different colour and has a different focus but somehow still all ties together. The font is beautiful too – bold, clear and changing in size to represent the different parts of the wonderful, rhyming prose. I’ve seen a few books in this bold, ultra modern style recently (a few more to come in future reviews actually) and I love them. Now onto the story. As you know I adore books with a comical element. Reading to Caterpillar is one of my favourite activities but if the book is dull it’s no so fun for the adult (even if the child is enthralled). Mum… is far from dull and garnered a very knowing chuckle from Hubs and I. 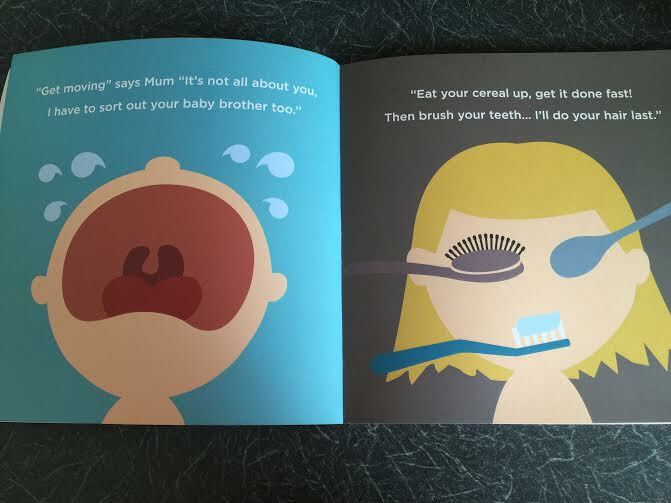 It might sound a bit odd to say a children’s book is relatable for the parents but this one is. The premise is a mum and child rushing around to get ready for the school run. Morty & Scott (who are men, by the way) capture all the madness of those early mornings beautifully, I defy any parent not to relate to the stress of trying to hurry your child along with those morning tasks whilst you watch the clock with increasing panic. 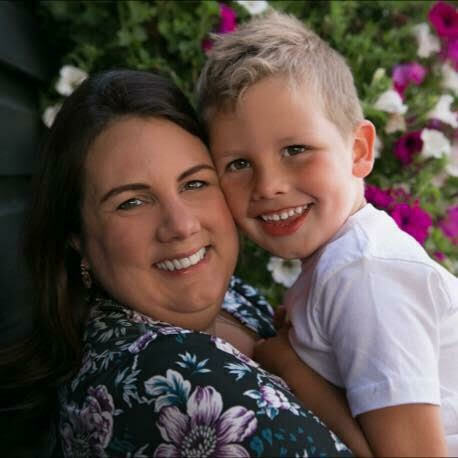 All through this story the child is trying to tell her mother something – “But muuuuum…” – but her mum only interprets this as whining or obstruction (as we do!). It’s only when you realise the twist at the end that the little girl’s persistence makes sense. At only three, Caterpillar is probably a little young to really grasp what’s going on but he loves the rhyming prose and vivid illstrations. I’d imagine for a slightly older child, perhaps four or five, the school morning storyline would enthrall them. I’d like to try the book out with my Godson and niece actually as I think at five and four respectively they’d really enjoy it. Morty Sey & Scott Chegg are new on the children’s fiction scene and wrote, illustrated and produced this book entirely themselves which, as someone who one day aspires to write my own novel, pretty much blows my mind. They are currently working on future publications, again based around the daily dramas we navigate as parents, and I’m really looking forward to their next offering. If you’re looking for a fun, funny & unique read then please check Mum… out, you can buy your copy here. To keep up to date with Morty & Scott’s fab work follow them on Twitter or Facebook. These look lovely 🙂 Thanks for linking up with #KCACOLS and hope to see you next week! I love it when a book contains humour for adults too. It sounds like a fun story and now I want to know what the twist at the end is! The book sounds fab. The images look stunning. Thanks for sharing! You’re right, the bright colour of the book and the title page did draw me in. We too also like books with a sense of humour – you should check out ‘I’ve Lost My Hat’ if you haven’t already. I love the illustrations and design of this book, you’re right it is so eye catching. I can completely relate to the premise of this story and I’m really intrigued by what the twist might be at the end. I really like modern kids books and this one sounds great. All kids books should make mm and dad chuckle! And thank you so much for such a wonderful review! !